A public lecture by Professor Rashid Sumaila, Director, Fisheries Economics Research Unit, University of British Columbia and UWA Institute of Advanced Studies Visiting Fellow. A crucial question still facing humanity is how to successfully manage the ocean to ensure long term sustainability. In this lecture Professor Sumaila will explore this question couched around three key issues, ie, how we tackle global warming and climate change; how we implement public policies such as the provision of government subsidies to the fisheries sector; and how we manage the high seas. 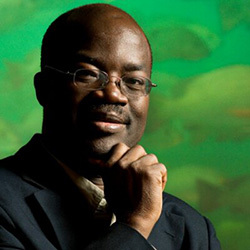 Professor Sumaila will argue that the chance of managing our ocean successfully for people and nature depends strongly on our ability to tackle the issues that affect the conservation and fair sharing of benefits from our ocean in such a way that positive feedbacks are transmitted between the two. The alternative is for negative feedbacks from conservation to people, and vice versa, to the detriment of both people and nature.